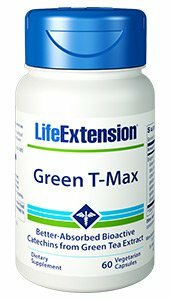 Green T-Max: The Origine 8™ extract in Green T-Max provides eight distinct catechins (nutrients that inhibit free radicals and inflammation) and is 12 times more bio-available than standard green tea extract. To maintain potency, Origine 8™ is extracted within six hours of being harvested. The unique extraction process preserves a broad-spectrum of green tea catechins – so much so that Origine 8™ is standardised to contain eight of these healthy green tea catechins. This extraction process also renders these catechin compounds 12 times more bio-available than those found in standard green tea extract. Bio-availability refers to how much of a particular nutrient actually enters your bloodstream and can be utilised by your body. Liposome encapsulation – this green tea extract is then wrapped in a liposome made of non-GMO sunflower oil and oleic acid to ensure freshness and stability. Green tea catechins inhibit oxidizing free radicals and boost defences against oxidative stress. They also help inhibit inflammation. The most famous green tea catechin is epigallocatechin-3-gallate, or EGCG. But it’s not the only catechin that provides health benefits. Cellular health: While EGCG has potent benefits for healthy cell proliferation, other catechins may be even more powerful. In fact, one study found that epicatechin gallate (ECG) and catechin gallate (CG) were more effective than EGCG in cell proliferation suppression and anti-inflammatory activities in vitro. Cholesterol support: Consuming catechins such as EGC, EC, ECG, GCG, and EGCG is associated with maintenance of cholesterol levels already within normal range. Plus, a pre-clinical study indicates that these catechins can inhibit the oxidation of LDL cholesterol in mice. Vascular health: A pre-clinical study indicates that epicatechin (EC) and catechin (C) encourage healthy vascular function by supporting healthy homocysteine levels, while catechin (C) also helped inhibit inflammatory markers. Other evidence suggests that these two catechins promote healthy endothelial and mitochondrial function in vitro. Blood pressure: During a 12 week double-blind trial, catechin (C) produced a greater change in systolic blood pressure compared to control.